CISS (Continuous ink supply system) is a device for minimizing printing expenses when using an inkjet printer, an all-in-one device or a plotter. You can save up to 95% (20-30 times less) of printing costs using CISS, compared to the usage of original cartridges! CISS as technology was created several years ago and is now used by tens of millions of people all around the world. 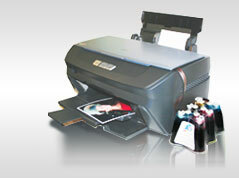 "INKSYSTEM" CISS printing quality differs by only 2-5% from original cartridge quality. At the same time you get 1000% economy! In our product range there are CISS for most inkjet printer models which were produced in the last 10 years.